We can give the appearance of straighter and whiter teeth that ‘suit you’ using teeth-shaped porcelain shells that bond onto your original teeth. We can demonstrate the appearance before any treatment is done. If you are not happy there maybe other alternatives. Straighter teeth can be delivered using conventional Orthodontics, where teeth are essentially ‘pushed’ into a more favourable position without any preparation of the teeth. Orthodontics still leaves options open to us. 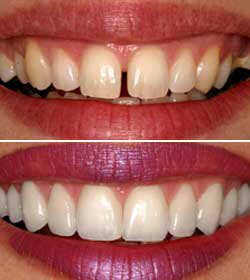 For example you could still have tooth whitening or veneers if required. Some treatments maybe a combination of these methods for best results. Dental veneers are bonded to the front of your natural tooth and are often one of the most conservative dental treatments we have; it is often possible to make cosmetic dental veneers with almost no reduction of your natural tooth underneath. How are dental veneers made? There are many techniques for making dental veneers, most involve a dental technician. This involves using impression goo to take a mould and then waiting 2 weeks while the technician makes your new cosmetic veneer. But in some instances we are able to restore your tooth in one appointment using our New Teeth While You Wait CEREC machine, this involves a digital optical impression (so no more goo) and as you only have one appointment you only need one injection. Cool huh? Ultimately the only way for us to judge if we can make your new veneers in one appointment and save you all that time is to see you for a review; so simply call us now on #9-40-23050089 while its fresh in your mind and within a few days you could have a brand new smile! What problems can dental veneers correct? Some cosmetic problems may involve more than veneers, for example restoring spaces from missing teeth. Implants for example can be used to ‘put back teeth’ with no damage to surrounding teeth. Implants can not only look good, but function like teeth too. They can even be used to stabilise dentures. Yes, even dentures maybe considered a cosmetic treatment.